One of the greatest challenges of being a backpacking photographer/videographer is how to haul around your DSLR in a way that’s relatively comfortable and accessible. I hiked over 1,200 miles in Glacier National Park with my DSLR Camera setup (which I blogged about) using a couple of great pieces from ThinkTank Photo. The case and the camera connection kit are listed below. If you use these links, you’ll get a choice of a free gift of gear depending upon how much you spend! I would love to hear what solutions you’ve come up with! Please post them in the comments below. Do you ever fall? Are you ever scared of damaging gear? Chest mounts work well for super quick shooting, but depending on what adventure your doing its sometimes best to have them in a pack. How is heat management during hiking with something on your chest? I’m pretty quick on the draw with my pack system, but still double your time I’m guessing. I did fall once. It scuffed the camera on a corner where it was poking up, but it stays mostly protected. If you are concerned about that, I think leaving it in the bag will do pretty well for it. The case is padded and it’s different than just straight up dropping it. It is warmer for sure. I tended to sweat a bunch right where it sits, but not crazy. I have found that some days it gets a bit itchy and you have to make sure that your sternum strap doesn’t get in the way. Do you think the backpack connection kit will connect to other non-ThinkTank serious many-night backpacks? Looks like it will, but you never know… Thanks! I think that you’ll be golden! As long as the pack has load-lifters, I think that you’ll be able to figure out the bottom part as well. What pack are you using? How does the bag protect against rain or are you doing something else to protect from rain and possible submersion on creek crossings? The bag comes with a rain-fly. I pull it over, but by using the two D-rings on the top, the rain fly doesn’t come all the way over and it stays mostly dry. What that means is that it’s just damp in the bag and sometimes I struggled with some condensation, but if you watch my blogs, I had ample rain and most of the time, I was able to get pretty good footage. I used a ziplock bag before but that was with a point and shoot. Don’t think I want to use something I get 30 of in a box for $3 protecting my DSLR. LOL. I was just curious if you were using some extra protection when crossing streams. I dropped mine in a creek in the Smokies once. Don’t want to do that again. With my DSLR, I would carry it with the long lens on and in my chest pack. If it was falling into the stream, I was also getting dunked too. Let’s just say that I had one river crossing where I was close to testing that. Ugh. Have you looked at the Camera Capture from Peak Designs? It is a secure clip – no bag around it. I am thinking about it. If it starts to rain hard, I’ll put the camera in a waterproof stuff sack in my pack. Whoa!! That looks super cool! I’ve been playing around with a backpack from Mindshift for day trips, but it takes a bit longer to get the camera out making me less likely to shoot birds and such. I’ve contacted them. If I can get my hands on one, I’ll do a review on it. I used the Capture for ~110 miles or so in Iceland, in a wide variety of weather, and terrain and it is far and away the best solution I’ve ever found. I’ve also tried the Cotton Carrier, but far prefer the Capture. It makes the process of stopping for photos MUCH faster, and it’s just easy. I’ve even used it with some very light daypacks successfully, though, it works much better with a little more substantial pack. I typically carry a ULA Circuit, and it works fine. With rain, I did the same thing as Mark – just put it in a waterproof sack in my backpack. I carry a Canon 60D, usually with a 17-40mm, but sometimes with a 70-300. No problems, even with the big lens. They have a new version out of the Capture now, but I haven’t tried it. Definitely worth checking out. I’m curious to know how you went with the un even weight distribution. A 60D with a 70-300 on is quite a lot of weight. I’m assuming you had the Capture attached to one of your packs shoulder straps so that’s a lot of extra weight on only one side of your pack. Did this configuartion tend to pull on the shoulder strap more than the other and cause the pack on your back to shift or rotate and not sit certrally on your back? Honestly, it didn’t cause me any problems. With the 17-40mm lens the total weight is about 2.75 pounds, and it’s noticeable, but it doesn’t cause my pack to shift or sit differently on my back. It didn’t bother me anyway. Take the camera gear away and my pack dry weight is 10.25 pounds, so pretty light. On that Iceland trip at full food/water/camera capacity I was right around 25.5 pounds. I didn’t have an issue with the camera pulling on the strap. I don’t typically leave the 70-300 mounted on the camera when I’m going to be walking. I’ve done it for short distances and it was okay, but the length bothered me more than the weight. I kept it in my pack, and only used it if I was going to be shooting wildlife in a specific area. It’s not the end-all, be-all – there are definitely some caveats. It takes some practice to get used to pulling the camera out and sliding it back in with one hand. It doesn’t work well with thin backpacking straps – I have tried it with a small daypack, an REI Flash 18, and those shoulder straps are very thin, and I was constantly adjusting the plate that attaches to the shoulder strap because it would dig into my chest. That wasn’t the case with the larger Circuit pack. But, compared to all of the other ways I’ve tried to carry an SLR on extended backpacks, it’s the best solution I’ve found so far. The first one is how important is it do you think to have your camera and lenses protected in a case while you hike as opposed to having it attached to a Capture and having it all exposed to the elements such as drizzle, sleet, snow, dust, sweat dripping off your forehead, sun tan lotion and being exposed to direct sunlight all day? Obviously if it starts raining you would pack it away. The second question is did you find your holster and lens case sat centrally as you hiked because it’s actually lop-sided. The lens case sits off one side of your holster and the camera straps attach to the holster so the centre of gravity is to one side. Ideally we want one case that can hold a body and both lenses and be centrally suspended from the straps but the only ones I can find on the market that are big enough are too heavy and I just wouldn’t consider them as a practical solution. Camera safety is always a priority. Most of the time, having it hanging out a little isn’t a problem. I actually would have the “nose” of the camera where the flash and logo are, hooked on the top of the bag with it unzipped and such so I could easily just pull it out and shoot. My experience while hiking and photographing was that things would flash in front of me and I had seconds to do what I needed to do. Obviously if it was raining, I’d do some other things. As far as it being lopsided, it’s only marginally so. I’d not let that deter you. The big trick is to make sure you have a pack that has those vertical stays instead of the loopy stays found in lighter packs. Lastly, I’ll be doing a blog soon on a new backpack by a company called Mindshift Gear http://www.mindshiftgear.com. While the pack is a daypack and it takes a little bit longer to get the camera out, it’s infinitely better than storing it inside of a pack that you have to take off and way more comfortable. Not a perfect solution, but another nice option. This is a message I left on Jon Anscher’s site about packing camera gear on a hike or trip. Hopefully it sparks some ideas for other on setup they could try out for themselves. 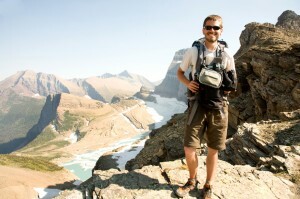 I enjoyed the blog about your backcountry backpack/camera chestpack setup. Plus the link to hike734 was helpful in trying out a few setups myself. I have links at the bottom of my message so you can see the parts of my setup and info. My setup has pro and cons but to each their own. I need to set it on the tripod then I just unclip the Thinktank straps from the OpTech connector on the camera. The Mindshift cover is not padded really well so I use OpTech neoprene snoot cover over my lens with my lens hood in the shooting ready position to protect the lens. The snoot bag also works as a lens cap for me to keep the elements off the glass when the camera is out and I’m walking around, I personally don’t like the plastic lens caps especially when the the hood is in position(pain to take off an back on). This allows me to keep the hood on all the time and just slide the snoot off when shooting. The snoot even has a clip that you can either attach to the OpTech utility loop using a s-biner or just directly clip it to your pack when you’re actually shooting pics. I like this setup because it’s not bulky and the cover looks generic and cheap so it’s harder to tell if you have an expensive or cheap camera inside which is a plus when traveling so it draws less attention than say a thiinktank digital holster or lowepro toploader. The only drawback is that long telephoto won’t fit unless you use the bigger cover( but that setup adds a lot of weight to your shoulder straps anyway). I’m going to try out a thinktank lens pouch that could strap to the hipbelt for the long telephoto or wide angle. This way the weight of the heavy lens is on the hip and I could change out lenses quickly without ever going into the backpack. For heavy weather conditions I keep a flat dry bag in the backpack so I would quickly unhook my camera and even the lens pouch from the hipbelt and slip them all into the dry bag in the backpack till conditions get better. My ideal back country setup would be using the system I mentioned with a wideangle on the camera and the tele lens on the hip plus maybe a 35mm prime in an optech snoot pouch clipped to the shoulder strap for an in between focal length without weight. In the country you’re either shooting wide for scenery or long for wildlife, the 35mm could be a filler or low light. Instead of having the thinktank straps attach to both back pack straps you can play with this setup and try to have all the thinktank straps on one side of the backpack like hike734 by playing with the length and tension of the straps so taking the backpack on and off is easier. I find the overall convenience of this setup better say compared to something like the thinktank holster series. The Mindshift cover and my camera are secured separately. After I pull my camera out of the mindshift cover I can put it to eye level and shoot while having the security of it still being strapped to the backpack straps, when I finish shooting I lower the camera and just slip the snoot back on as a lens cap/protection and place it in the mindshit cover. I really like the thinktank and lowepro holsters but it adds bulk and once I actually take the camera out of the bag the bulk gets in the way when shooting and plus my camera is free to fall from my hands rather than still being tethered to my bag. Traveling with a buddy is ideal because you can put lenses in an easy to access part of their pack so you can get to it easy as long as the extra weight doesn’t kill them. I usually keep a Tenba pro digital padded bag insert in a diaper bag or wife’s purse for easy lens changes when traveling, or I put the tenba in a drybag and stash it in the bottom of my son’s stroller for easy access without having the burden of heavy gear weighing me down. I recently bought a small Hazard 4 Evac plan B tactical bag for a short hiking, biking, travel or around town bag with another set of think tank straps attached to the molle sling strap so I can have the same convenience of having the camera and mindshit cover tether to the bag at all times so I can be hands free. The extra convenience of the plan b bag is that it is a sling style so I can unhook my camera and slide the backpack around my body to access the gear in my backpack without taking it off. I might even experiment to see if the thinktank digital holster 10 will loop through the molle attachment on the shoulder strap using the speedbelt attachment on the back of the holster…that way the bag and camera stay snug on the shoulder strap and I can keep it in place when I slide the backpack to the front to access the main backpack. Having all the molle also means I can use a F-stop tripod bag to attach a tripod to my packs without people knowing that its an expensive carbon fiber tripod inside, or I can use it for tent stakes or other misc. gear. These are all just ideas to ponder, maybe a piece of info will spark an idea for a setup change or adjustment. My quick message turned into a blog post in itself. I’ll probably post this on hike734’s site too just in case it can help others. Hey, I know this is an older post but still relevant. I’ve tried many camera bags and setups before and I am yet to find one that works. Most of my needs are for day hikes with the occasional overnight or several night hike. I try to limit my gear to my DSLR, Canon 7D and max 3 lenses (one mounted and 2 extra). I usually have an 18-135mm, a 10-22mm or my 8-16mm and my 100mm macro. This changes around a bit depending on where I am hiking. The toploader from LowePro (along with a backpack) I find that it limits air flow, so after a few hours of hiking on a hot day, my chest is soaked. I found one solution which was great, the LowePro Offtrail 1, but it’s too small for my 7D with a lens, and the pouches for it are always mounted to it, not giving enough room for any other gear or changing to a larger pouch. I was looking at the Thinktank modular belt system but I’m not sure I’m sold on it yet. Ideally, a modular setup that can house a DSLR with a lens, then additional, separate pouches, all that can mount to any belt or attach to a military style vest, would be ideal. This way I can mount them anywhere. For day hikes I have a military belt with a military style pouch and a water bottle holder, adding a camera and a lens to this would be great and not restrict movement. Anyone know of some products like that? Thank you for the reply and setup information. I’ve decided the best solution for me is to go to lighter and smaller cameras for hiking along with a cellphone (LGV30) with better camera features as a backup. Going lighter and smaller means I can carry the essentials in a RIBZ pack for easy access and leave the less essential stuff in whatever backpack I’m using. I decided I would rather enjoy the hike instead of worrying about perfect image quality. The RIBZ pack can get a little hot in the summer if you over load it but you can unzip them apart to get some air circulation in between, as long as you don’t overload it. I usually keep a zoom lens on the camera most of the time with a higher F -stop range because most of my pics are taken during the day time. Heavier lens, with lower f-stops are kept in the backpack and packed modular to make it easy to find in the bag for low light situations. Thanks for the feedback. Looked at the RIBZ product and I think I would rather go with either a toploader or the Thinktank in that case, at least they are a bit more camera oriented with better padding. I’ve been looking at going to a mirrorless DSLR to reduce size and a bit of weight. For me, I’ll enjoy the hike regardless, but I want to have the good shots. So I’ll sacrifice a bit. I have a Domke wrap padding inside the RIBZ for cushioning, not as stout as the Toploaders but half the bulk. With the mirror-less its so much less cumbersome. Most times I leave the backpack in the car and just wander with the RIBZ on and camera tucked away. The RIBX especially comes in handy when biking, kayaking or other activities because it stays more snug to the body than having a toploader clipped onto a backpack or harness. I’m sure more product will come out in the future that will make it easier to be outdoors and still get great shots, eventually a phone will probably have all the megapixels needed to suffice.